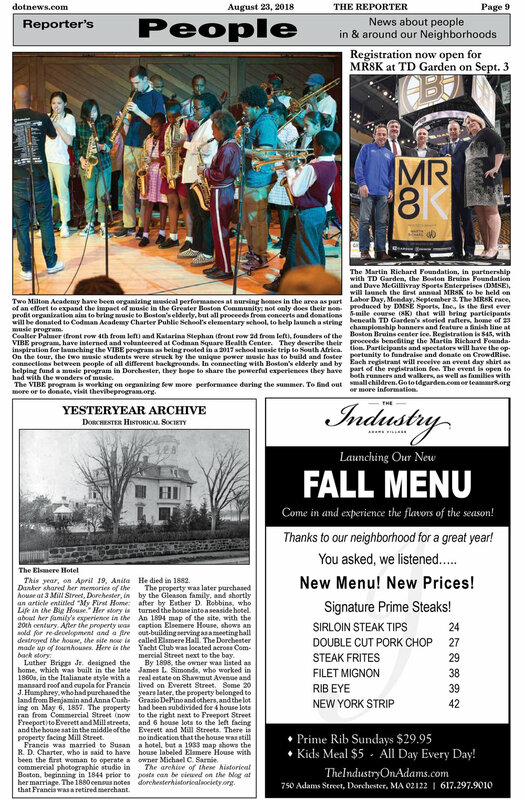 The Vibe Program was written about in the Dorchester Reporter, a community newspaper serving the Dorchester area in the Thursday, August 23 issue. VIBE is mentioned on page 9, quoted below. The full issue can be accessed here. “Two Milton Academy have been organizing musical performances at nursing homes in the area as part of an effort to expand the impact of music in the Greater Boston Community; not only does their nonprofit organization aim to bring music to Boston’s elderly, but all proceeds from concerts and donations will be donated to Codman Academy Charter Public School’s elementary school, to help launch a string music program. Coalter Palmer (front row 4th from left) and Katarina Stephan (front row 2d from left), founders of the VIBE program, have interned and volunteered at Codman Square Health Center. They describe their inspiration for launching the VIBE program as being rooted in a 2017 school music trip to South Africa. On the tour, the two music students were struck by the unique power music has to build and foster connections between people of all different backgrounds. In connecting with Boston’s elderly and by helping fund a music program in Dorchester, they hope to share the powerful experiences they have had with the wonders of music.